A black and white photograph of the Remembrance Day Parade on November 11, 2005. 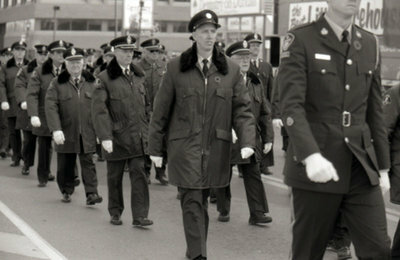 In this photograph members of the Whitby Fire Department are marching towards the Royal Canadian Legion. Remembrance Day, November 11, 2005, Carl Ferencz. Whitby Archives A2013_014_001B.